Mera, Queen Of Atlantis #6 Review - A Great Ending! Mera, Queen Of Atlantis #6 Review – A Great Ending! The grand finale of this miniseries, Mera, Queen of Atlantis #6 brings everything to a head in a very satisfying conclusion that only adds larger stakes to the eventual battle for Atlantis. 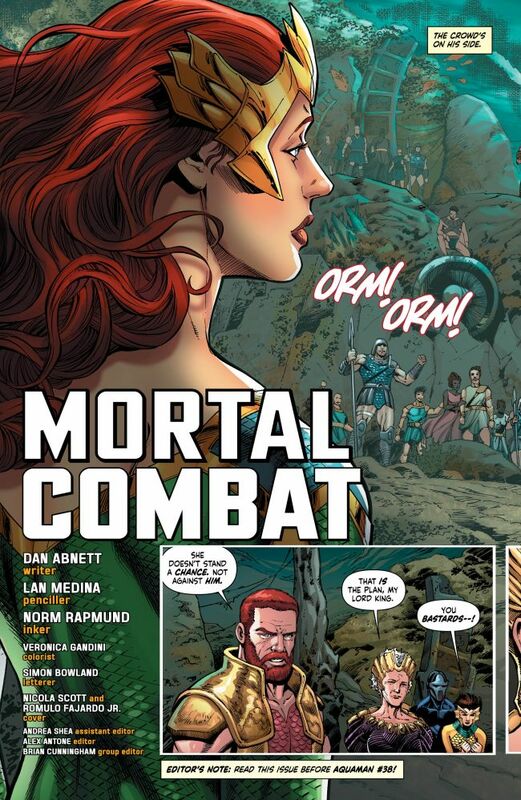 The ritual combat that is to take place between Mera and Orm is not only for the crown, but also with Orm’s own sister’s potential marriage at stake. Furthermore, whoever is to win this battle, can lead Xebel’s army into battle, against the usurper who sits on the Atlantian throne. The tense battle never truly had readers in doubt as to who would emerge victorious, however, the Ocean Master’s spiral into becoming power hungry much once again, felt earned. Throughout the series, Orm seemed to have redeemed himself. His call to duty was always a sticking point, however, and it seems even his above water family wasn’t enough to quell his hunger for power and his strive to be dutiful to those under the ocean. Throughout this series, the narrative has been clear and concise with very planned out end games for each character. As soon as the Ocean Master had returned to the seas, it was clear he wouldn’t be stepping on land again. Becoming imprisoned after the contest, he was not given another chance for redemption, with his sister doing the duty of telling his land family the fate of their husband and father. This had been a consistent internal struggle throughout and this was, unfortunately, the worst case scenario for the redemptive arc. 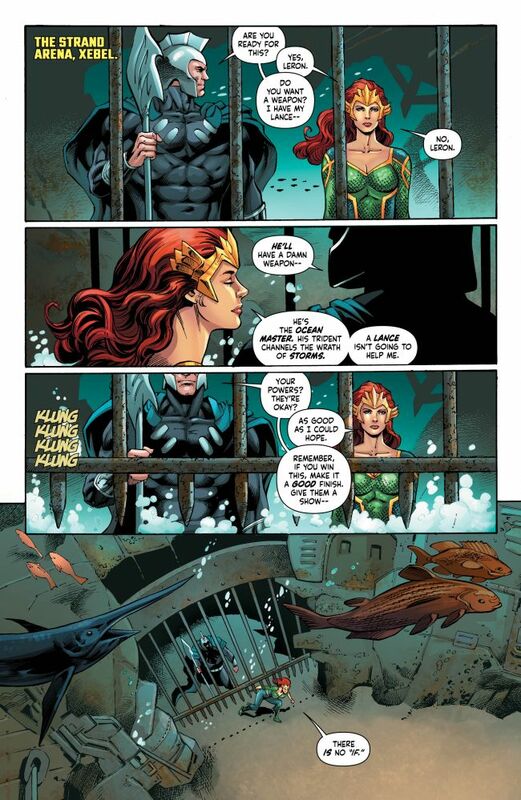 Elsewhere, King Nereus and Mera’s Grandmother have been beaten, with the King standing by his word and her grandmother slyly claiming this was the plan all along. The Ollena Tyrell of the series, this was a great final moment for the character who is always one step ahead. Mera herself has realised why she is destined to be the Queen of Atlantis and it’s shown in her honour and her own duty towards family. The army she now leads should be very effective in the battle for the throne, with Aquaman #38 showing us the outcome of this help that Mera has procured. Throughout this series, the narrative has been clear and concise with very planned out end games for each character. The one surprise for me was that Mera’s mentor was not killed in battle, but this was, of course, a happy surprise due to how he had been written. Each character arc has been well thought out and has added a few more wrinkles to the underwater lore. I would honestly argue that this art has been better than that seen in the Aquaman book. The art has been stellar and of particular difficulty considering the large proportion that has been underwater. I would honestly argue that this art has been better than that seen in the Aquaman book. Short series like these are really excellent for strong character work and filling in the gaps in narratives and I love that comics continue to do this, especially with characters that are unlikely to gain their own full title. I’d love to see this pushed further, with perhaps a series focusing on Orm now that he has completely fallen from grace and his journey back, perhaps towards his family. I’m very happy that Mera, Queen Of Atlantis was as good as it was and I believe they’ll be a few more Mera fans after this, ahead of her role on the big screen.